WHEN Katherine Reed’s husband Jim was deployed for seven months in 2012, the mum-of-two was determined the family would remain in close touch while separated. So when a Reading Force scrapbook was sent home from then-eight-year-old daughter Ellie-May’s school, she embraced the idea. The family chose to read Diary of a Wimpy Kid. Although Rosie was just one, she loved listening to her mum and sister read aloud. Katherine emailed passages of the book to Jim so he could read the same pages as his family at home. He was then able to use FaceTime to read passages to Ellie-May, with his daughter sometimes returning the favour. The family was also encouraged to write more regularly, with Katherine appreciating the opportunity to keep the resultant letters from Jim, some of which were stuck into the scrapbook alongside a family photograph, drawings and writing about the book. 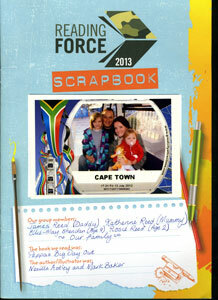 The Reeds’ colourful scrapbook won a prize of a family ticket to Paulton’s Park in the Reading Force competition. “I keep a memory box for both of my children,” says Katherine. “We’ve put the scrapbook in Ellie-May’s box and this year, when Jim was away again, we did one on a Peppa Pig book because Rosie loves them. “I’ve told friends about Reading Force, but we didn’t realise every Service family can take part – they can!